The background colour of Outline view note icons, or dogears in other views, changes according to the age of the note. The colour reflects the time passed since the note's date of creation (or subsequent latest edit); it is initially light blue, "dries" after about a day to white, and then gradually yellows over the course of a year. The duration since creation/edit for triggering colour ageing transitions is not documented. The JPG compression in the illustration has greyed the light blue of new/recently edited notes, which is more pronounced when seen live in Tinderbox. 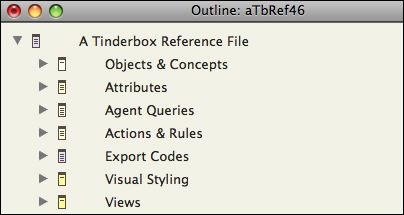 In the illustration, 'Export Codes' and 'A Tinderbox Reference File' have been edited within the last day or so, 'Object & Concepts' less recently than that but more recently than 'Agent Queries', etc. 'Views' shows the fully aged colour.